Insomnia is the word used to describe the condition where you have difficulty falling asleep or staying asleep. When this occurs over a few days, you will notice that you can become more irritable and moody, and your energy levels throughout the day will feel depleted. You may also develop tension headaches during the day, as well as gastrointestinal discomfort. These symptoms can then affect your overall health, quality of life, and even your work performance. All age groups are affected by insomnia, although among the adult age group, women are twice as likely to experience insomnia compared to men. This is believed to be as a result of hormonal shifts during the menstrual cycle or during menopause. If you think you have insomnia, it's always a good idea to visit a doctor since long-term insomnia can lead to obesity and an increased risk of high blood pressure, heart disease, or diabetes. However, it is best to avoid jumping into taking prescription medications immediately. Instead, there are some simple changes that you can make in your everyday routine which can resolve insomnia naturally. Read on to learn more. By making some simple lifestyle adjustments, you can often relieve insomnia within a few days. For example, the amount of caffeine, alcohol, and nicotine we consume are things we can control, and reducing all of these things can help you get to sleep more easily. Similarly, if you suffer from depression, stress, or anxiety, you can try to treat each of these conditions which may indirectly relieve insomnia. If taken 15 minutes before your bed time, a glass of warm milk is a wonderful insomnia remedy. It can help soothe your nervous system, which makes you relax and fall asleep more easily. Chamomile tea is often used as a natural insomnia treatment. Chamomile tea bags can be found at most natural food stores or grocery stores. For maximum effectiveness, take this tea 30 to 45 minutes before bedtime. Hops have been used as a sleeping aid for centuries, since the oils found in the dried fruit act as a sedative. A simple hop tea can be used to alleviate stress during daytime and before bedtime. Simply add 1 tablespoon of whole hops for every part of boiling water to make this tea. You can also find hops flower capsules in many health food stores or online. Although hops are generally safe, some individuals may be allergic to them. Therefore, use this remedy with caution. Valerian is an herb that acts as a mild sedative, which makes it an effective treatment for insomnia. Valerian has a group of chemicals called valepotriates and valerenic acid that have been shown to depress the central nervous system, resulting in a calming and soothing effect. This herb has also been shown to have antibacterial and antidiuretic properties that lowers blood pressure. You must be careful when using valerian though, since there is evidence that it can be habit-forming when taken in large doses over time. Therefore, it should only be taken in short periods of up to one month, or only when sleep disturbance is negatively affecting your quality of life. It should also not be used if you are pregnant. A typical recommendation is to take 400 to 600mg of valerian product, which has a standardized dose of 0.5 percent essential oil, about one hour before bedtime. Valerian root capsules can be found in many health food stores, or through online retailers such as Amazon. Although its name may not be particularly calming, the fresh and dried leaves of Passion Flower contain alkaloids and flavonoids that can act as a significant tranquilizer to the body's central nervous system. It is known to reduce spasms and anxiety, which promotes a general feeling of well-being. A simple tea made can be made before bedtime by adding 1 to 2 teaspoons of the dried herb to a cup of boiling water. Let the tea steep for 5 minutes, and then use a strainer to remove the leaves and enjoy. If you have difficulty finding the dried leaves in your area, you can instead try Passion Flower extract that is available in many health stores or online The typical dosage is 1ml of liquid mixed into a glass of water once per day. Valerian root is a natural remedy for many stress and anxiety related conditions, including insomnia and migraines. This herb is great for treating sleep disorders, skin problems, and cramping. 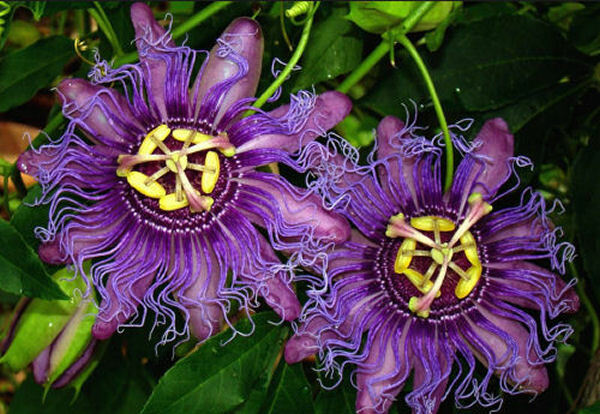 Passionflower is a plant that can treat conditions such as anxiety, insomnia, and inflammation. Today will be the first time I'll try Camomille tea to see if it helps me from not getting up at 4 or 5 am. Let's hope it works.